Definition at line 34 of file dummy-client-face.hpp. 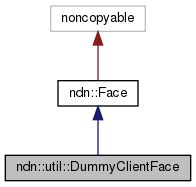 Create a dummy face with internal IO service. Definition at line 98 of file dummy-client-face.cpp. Create a dummy face with internal IO service and the specified KeyChain. Definition at line 106 of file dummy-client-face.cpp. Create a dummy face with the provided IO service. Definition at line 113 of file dummy-client-face.cpp. Create a dummy face with the provided IO service and the specified KeyChain. Definition at line 121 of file dummy-client-face.cpp. Definition at line 128 of file dummy-client-face.cpp. Definition at line 253 of file dummy-client-face.cpp. Definition at line 265 of file dummy-client-face.cpp. Definition at line 276 of file dummy-client-face.cpp. References ndn::lp::Packet::add(), ndn::lp::Nack::getHeader(), ndn::lp::Nack::getInterest(), ndn::lp::Packet::wireEncode(), and ndn::Interest::wireEncode(). Definition at line 290 of file dummy-client-face.cpp. Definition at line 314 of file dummy-client-face.cpp. Interests sent out of this DummyClientFace. 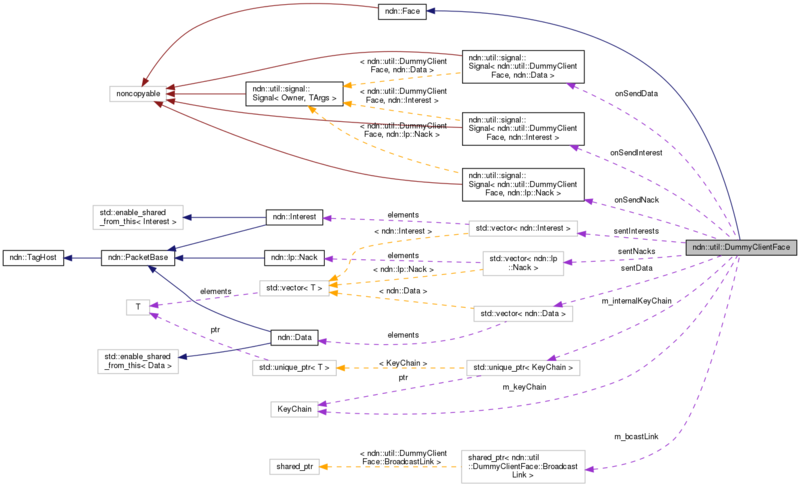 Sent Interests are appended to this container if options.enablePacketLogger is true. User of this class is responsible for cleaning up the container, if necessary. After .expressInterest, .processEvents must be called before the Interest would show up here. Definition at line 153 of file dummy-client-face.hpp. Data sent out of this DummyClientFace. Sent Data are appended to this container if options.enablePacketLogger is true. User of this class is responsible for cleaning up the container, if necessary. After .put, .processEvents must be called before the Data would show up here. Definition at line 161 of file dummy-client-face.hpp. Nacks sent out of this DummyClientFace. Sent Nacks are appended to this container if options.enablePacketLogger is true. User of this class is responsible for cleaning up the container, if necessary. After .put, .processEvents must be called before the NACK would show up here. Definition at line 169 of file dummy-client-face.hpp. After .expressInterest, .processEvents must be called before this signal would be emitted. Definition at line 175 of file dummy-client-face.hpp. After .put, .processEvents must be called before this signal would be emitted. Definition at line 181 of file dummy-client-face.hpp. Definition at line 187 of file dummy-client-face.hpp. Definition at line 190 of file dummy-client-face.hpp. Definition at line 191 of file dummy-client-face.hpp. Definition at line 192 of file dummy-client-face.hpp. Definition at line 193 of file dummy-client-face.hpp. Definition at line 194 of file dummy-client-face.hpp.